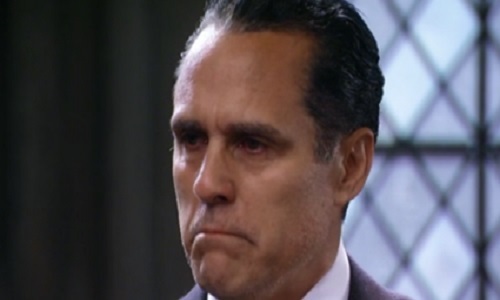 General Hospital (GH) spoilers tease that Sonny (Maurice Benard) will fear more trouble. He’s got a real mess on his hands thanks to Nelle’s (Chloe Lanier) accusations. Sonny doesn’t want to see Carly (Laura Wright) suffering like this, but there isn’t much he can do at this point. To make matters worse, Sonny’s got a problem of his own and it’s starting to snowball. Mike (Max Gail) has been running his mouth again. He told Felix (Marc Anthony Samuel) that he helped Sonny by moving a guy in Croton. The good news is Felix misunderstood the situation. The bad news is Mike could keep spilling info to Felix or anyone else in town. Sonny will definitely remain concerned about Mike’s loose lips. He’ll hope he can crack the case before someone goes poking around. This is basically a race to get to the body and gun before the cops. If Sonny can move the evidence to a better location, the police might assume Mike’s talking nonsense. Alzheimer’s can make people claim all sorts of crazy things, so Sonny will have that fact on his side. It’s unfortunate for his relationship with Mike, but at least it would be a benefit in the investigation. However, Sonny has to pry the truth out of Mike first. That could certainly be a tough task. One minute Mike remembers the incident in Croton and the next he doesn’t have any inkling. Luckily, GH fans just got a big hint out of that conversation with Felix. Mike suggested that he moved the guy “closer to home.” Did he mean closer to the victim’s home or closer to Sonny’s place? The former could take Sonny on an interesting journey. The latter could leave Sonny scratching his head around Port Charles. Either option sounds like it’ll bring plenty of General Hospital drama. Bottom line, Sonny will be scrambling in the near future. He’ll have to figure out how he’s going to score the whole story from his father. Sonny’s best bet is to wait for lucid days and seek the scoop one step at a time. That’s his ideal tactic, but it’ll also boost the risks. As Mike discusses Croton more and more, he’ll have it on his mind and that can lead to extra spillage. Plus, the waiting game will be downright unbearable for Sonny! General Hospital spoilers say Mike’s next clue could come on June 15. 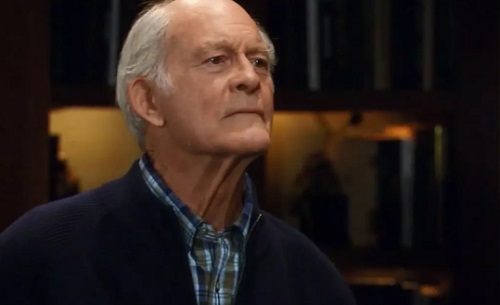 Will he tell Sonny the new location of the proof against him? Will he make Sonny solve a tricky riddle instead? It looks like Sonny will find out what he needs to know soon, but can he beat the cops to it? We’ll give you updates as other GH details emerge. Stick with the ABC soap and don’t forget to check CDL often for the latest General Hospital spoilers, updates and news.